Of all the things I teach, I find reading comprehension the hardest. The retrieval type questions are OK, as are the technique ones, but teaching things like inference is quite tricky. I’ve found a workaround by teaching it from the opposite direction – giving the children a piece to read where the characters are shaking or crying and asking how they can tell the character is sad, scared, etc. It’s really hard to find good resources to help though. There are books with lots of practise questions, but if you don’t know how to answer them then no matter how many questions you attempt, you still won’t be able to. At last I have found a solution. 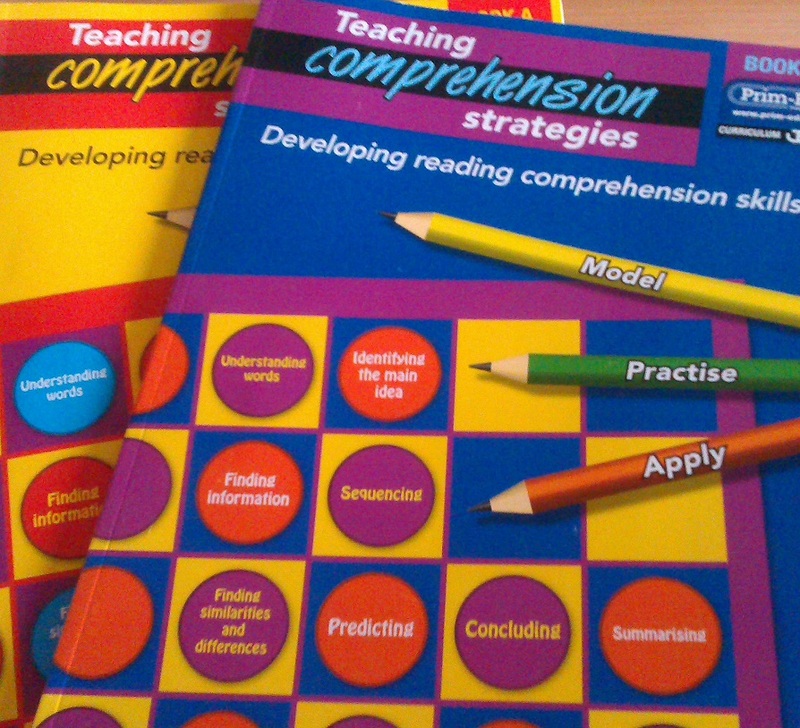 It’s a series of books called Teaching Comprehension Strategies from Prim-Ed. They take the various types of questions: summarising, predicting, concluding etc and explain step by step how to answer each type. Each question type is split into three stages. On the first page are some multiple choices with an explanation for each choice as to why that answer is good, unlikely, perfect or impossible. Next up are a few questions with hints on where to look and how to work out the answers. To finish are questions to answer independently with no clues. As a bonus, the books aimed at younger readers are not at all babyish, so I can use them with my struggling readers without them feeling demotivated at reading things aimed at “babies”. I’ll be honest, I wasn’t sure about this one when I started it. It doesn’t work as a standalone book as the beginning makes no sense unless you have already read The Lost Hero. However, if you have read The Lost Hero first, then there is no suspense about why Percy Jackson has lost his memory or whether he will regain it. In fact a second book in a row where the hero has amnesia is tedious in places. Camp Jupiter is also less welcoming than camp Half-blood, which makes it harder for the reader to invest in the characters. I can’t help but feel that the first two books in this series would have been better had the events happened simultaneously so that they could have been entwined in one book. Fortunately, Frank and Hazel from this book are strong enough to win the reader over, and the second half of the book is enjoyable. There are also enough teasers at the end to promise that the third book, The Mark of Athena, will be a good one. I’m not a literary snob, really I’m not – I’ll take a ‘thumping good read’ over a ‘short-listed for the Booker prize’ any day. Even so, when I began working with a child who hated reading but who said he was prepared to give the Beast Quest books a go, my heart sank. How on earth was I supposed to find anything of merit in Beast Quest? The book Daniel* chose was Nixa the Death Bringer from the Avantia series. I decided to work on one chapter per one hour session, so I wrote down 10 questions for each one, which left time to read the chapter at the beginning of the session, and to make a prediction at the end as to what was going to happen in the next chapter. And so, with a sense of despair, I started reading it with a pen in my hand to write down questions. Obviously I managed to write some retrieval questions – they were the easy ones. I hadn’t expected to be able to come up with much more than that though. There were opportunities for Daniel to give and justify opinions (Do you think the title of this chapter was a good one? Why (not)? Do you think the main character made the right decision at the end of this paragraph? Why (not)?) and also to pick out other people’s view points in the text. There were chances for him to show his understanding by explaining what various pronouns referred to, some of which referred to things in the last or even last but one sentence. I found examples of alliteration, similes, homonyms….even anthropomorphism! As Daniel got quicker at answering the questions and at finding the evidence in the text to support his answers, we started to have a few spare minutes at the end of the sessions where we could look at short snippets from other books and even answer a question or two about them. The result? Daniel realised that not all books are boring…he has even started reading for pleasure at home! Last session he proudly told me that the previous evening, instead of spending all his time playing on his Xbox he had read the first 34 pages of Harry Potter. I’m really glad I took a gamble on basing reading comprehension tuition around Beast Quest instead of just dismissing it out of hand. For English tuition in the north Birmingham area (Great Barr, Hamstead, Kingstanding, Pheasey, Perry Barr, Streetly) get in touch via my contact page. Rick Riordan was recommended to me by a Year 6 boy that I was tutoring, and as he had tried several authors I had suggested to him, I thought I should give his recommendation a go. I’m glad I did. I read the whole of the first series in one go. It’s taken me a while to get round to series two – partly because I was worried that the new trio of characters wouldn’t be as good. I didn’t need to worry – Jason, Piper and Leo are just as heroic as Percy, Annabeth and Grover. With different godly parents, they have a whole new set of gifts to get them out of fixes. Since Jason is slightly older than Percy was in the previous series, the book will probably appeal to older children – certainly to upper KS3 and possibly even into KS4. It hasn’t lost any of the appeal for younger readers though, and the sporadic appearances of Annabeth provide a satisfying bridge between the two series. The monsters in this book are badder than ever – and with a new all-powerful villain as their new mistress, they are harder to kill. A must read for any child (or adult) who likes their adventures with a classical twist. I tutor a couple of children who hate reading. I don’t mean they’d rather play football or computer games than read, I mean they’d rather gargle saltwater than pick up a book. It’s always a challenge to find something that children like this will read. I thought about getting them to read magazines or comics instead, but there doesn’t seem to be the same range of titles or quality of articles as there used to be. I’m going to show my age now, but when I was younger there were age-appropriate magazines with a range of types of writing inside. For younger girls there was Girl, and for the older ones, Jackie. They had photo stories, full length written stories, page-long articles about how to apply make-up, problem pages. It wasn’t just the girly girls who were catered for. My friends and I used to read Shoot, which had interviews with all our favourite football players, discussions about tactics, a letters/opinions page…. There was also Look-in with features about TV shows and several comic strip stories. I recently scoured the children’s magazine section of a large newsagents, looking for something suitable, but with only a couple of exceptions, there is nothing. I know that people get up-in-arms about the phrase ‘dumbing down’, but in my opinion that is what has happened to children’s magazines. The emphasis seems to be more on the free gifts than the content, which seems to consist of lots of photos of celebrities and/or footballers with a two-line caption under each one, and pages of word searches and spot the difference puzzles. I picked up magazine after magazine and found them all to be the same. The only exceptions were First News and National Geographic for Kids. Both of these have interesting and informative articles of a reasonable length, with the quality of writing I want my pupils to be producing themselves. The two pupils I mentioned at the beginning of this piece have enjoyed both of these publications. If only there were more magazines of this calibre. How can we ever hope to encourage our children to read more if we don’t provide them with good quality alternatives to books? What about you? If you have found any good alternatives I’d love to hear about it in the comments below.